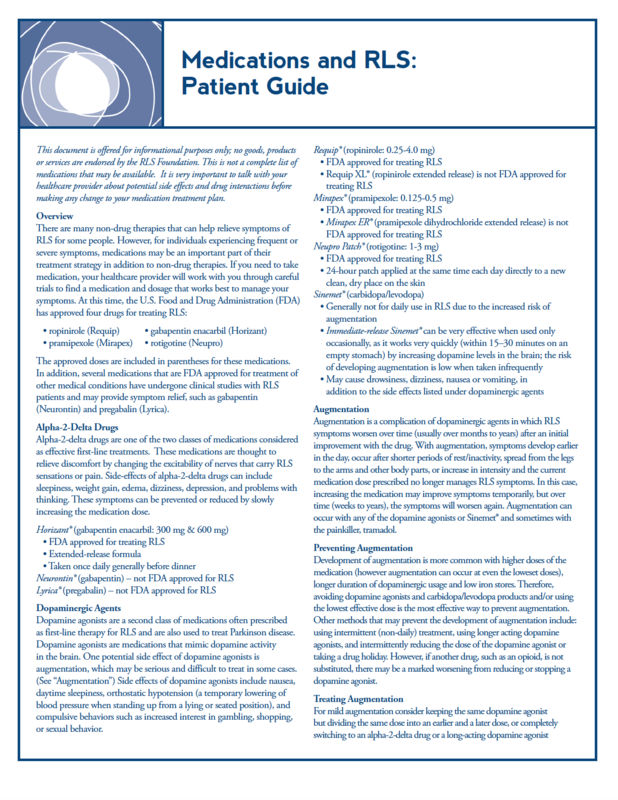 Inside: Detailed information on RLS symptoms, possible causes and available treatment options. 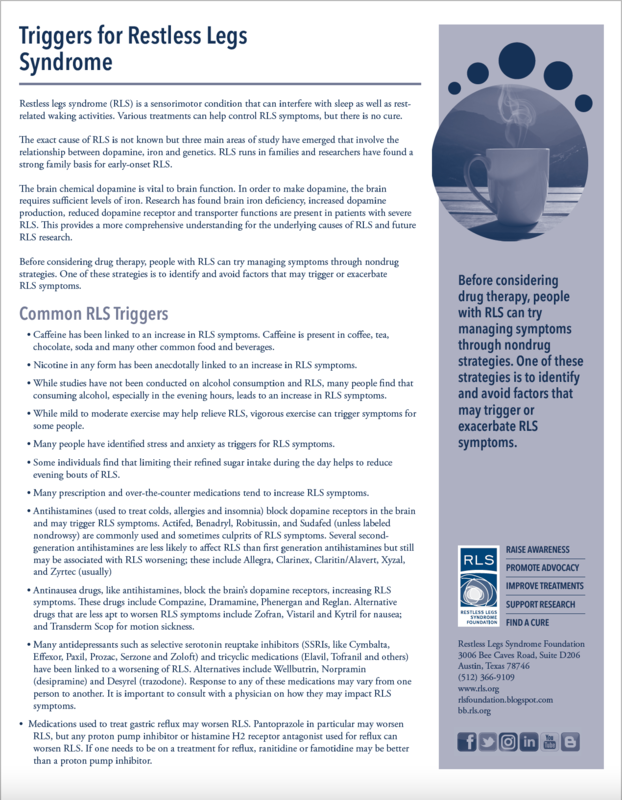 Inside: This patient handout offers an overview of RLS symptoms, treatment, coping methods and more. Inside: Track daily symptoms, then share with your healthcare provider to help aid a proper diagnosis. 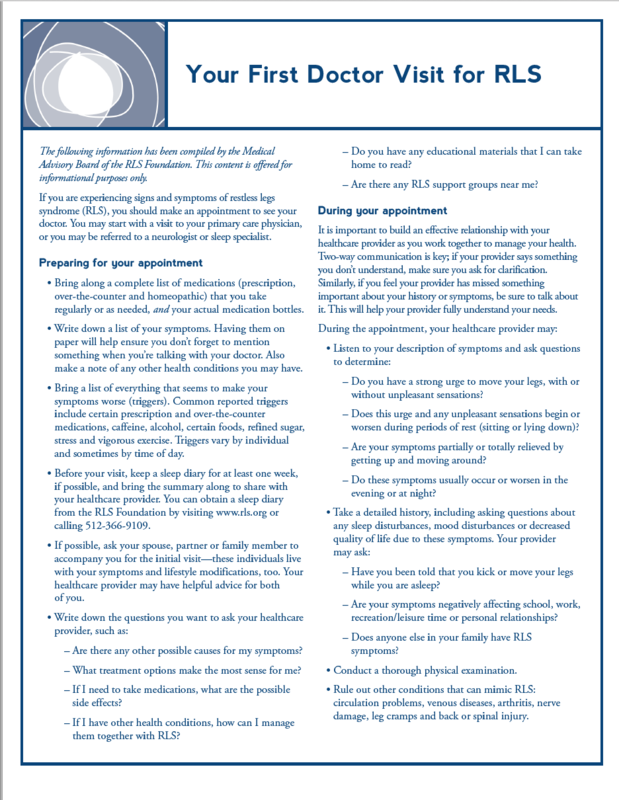 Inside: Things to consider when preparing to meet with a doctor for symptoms related to RLS. Inside: This is a card with basic medical information you can carry in your wallet in case of an emergency. 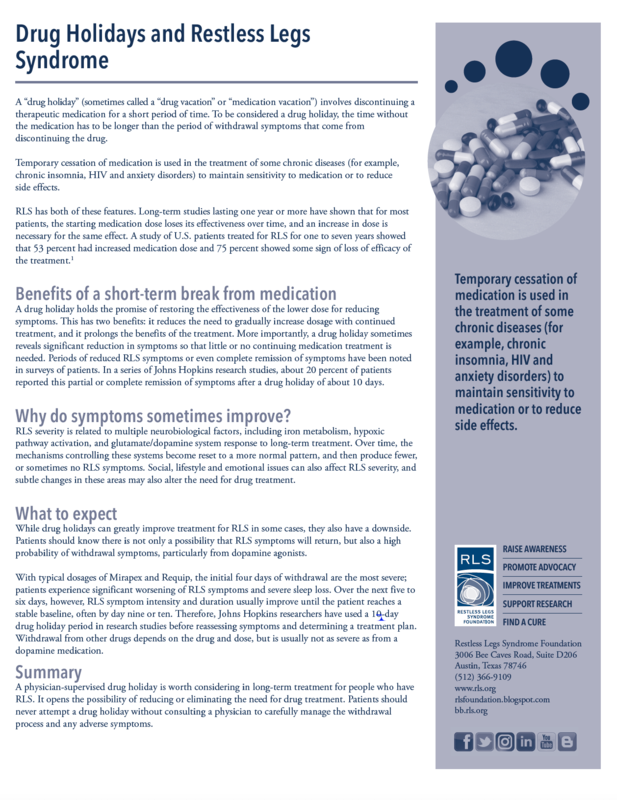 Inside: This article discusses several other medical conditions that may produce symptoms similar to RLS. 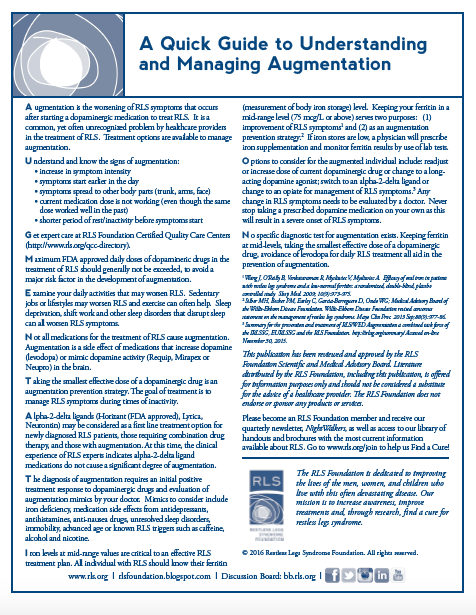 Inside: Answers to frequently asked questions about the medication options to manage RLS. 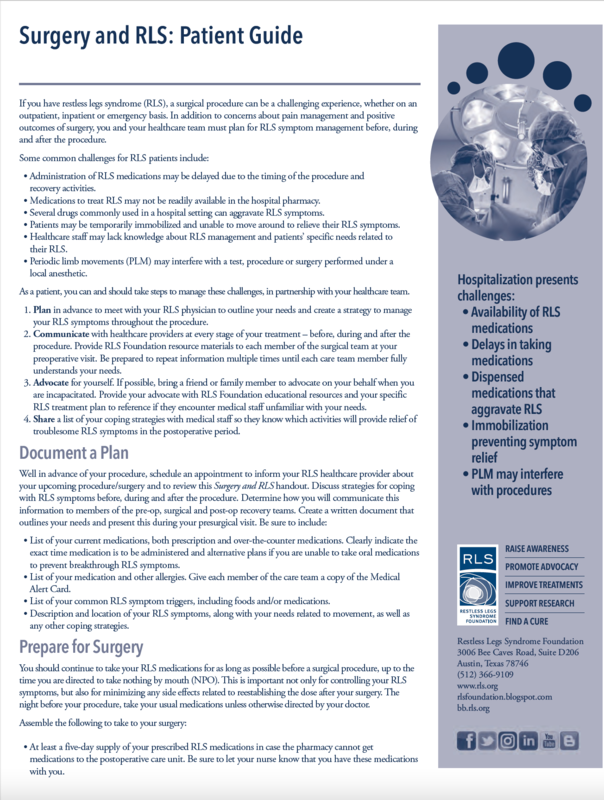 Inside: Special considerations for RLS patients preparing to undergo surgery. Inside: A checklist of things to consider before entering the hospital for testing or surgery. Inside: Advice on how to incorporate physical activity into your daily life. 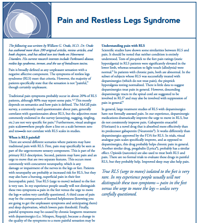 Inside: Information to help understand the link between RLS and pain. 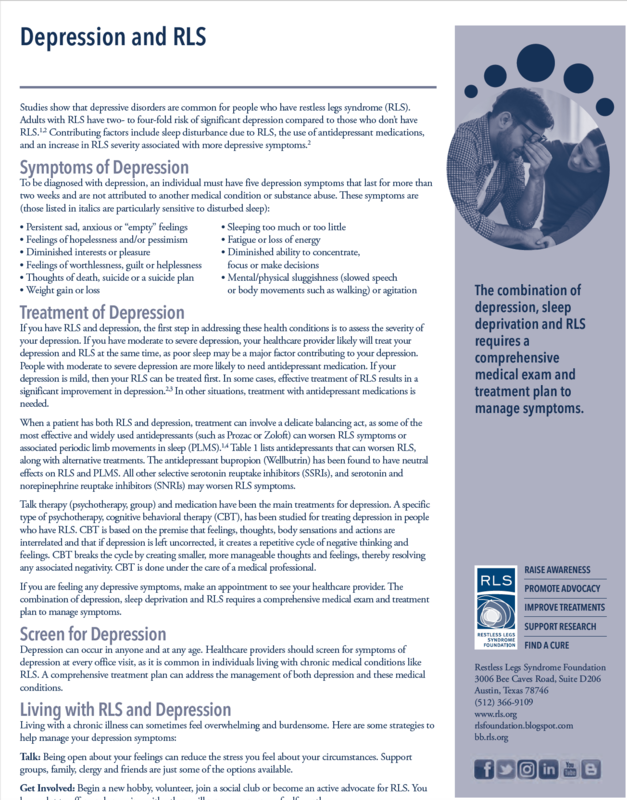 Inside: Special considerations in treating depression in the patient with RLS. 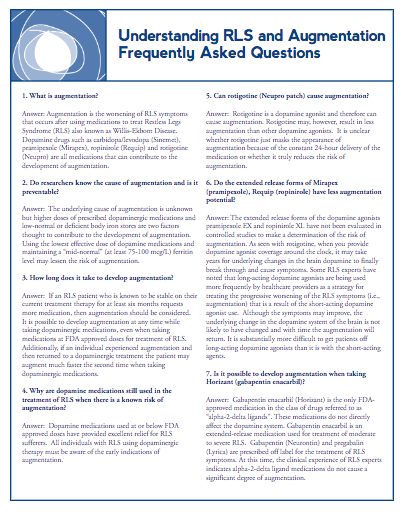 Inside: Considerations for managing RLS in an elderly loved one. 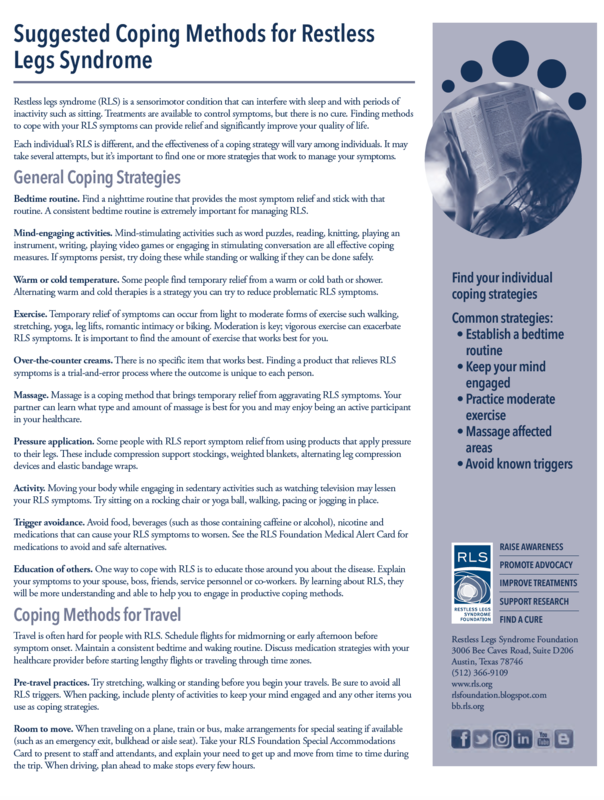 Inside: Learn the signs of RLS in cognitively impaired adults. 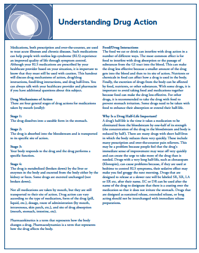 Inside: Important information for those considering participation in a clinical trial. 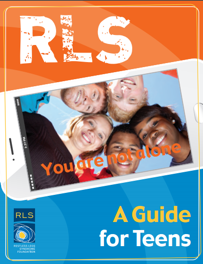 Inside: Guidance for parents whose child is diagnosed with RLS. 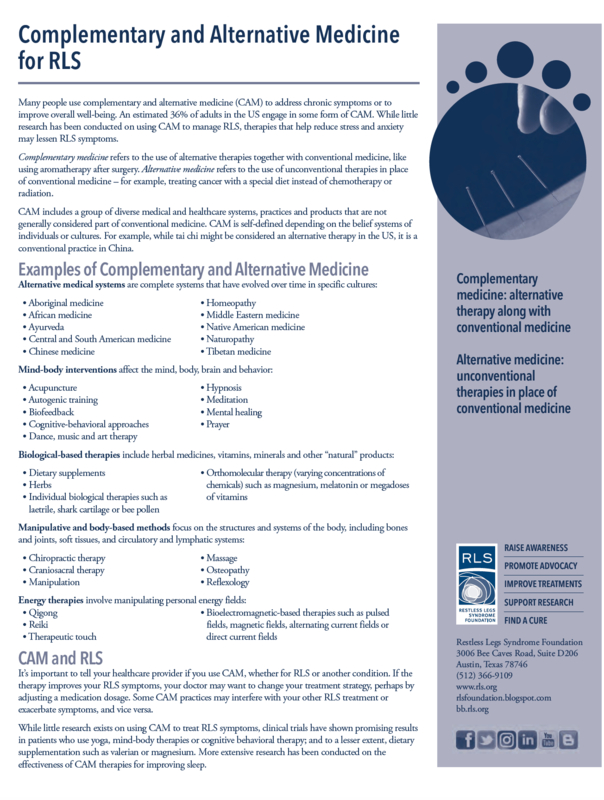 Inside: Medications are used to treat both acute illness and chronic diseases. 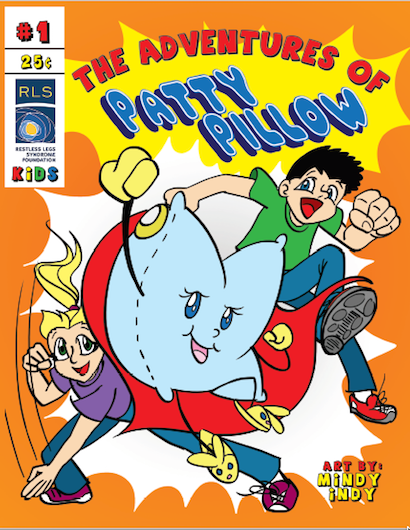 Learn how drugs work and interact with food and beverages. 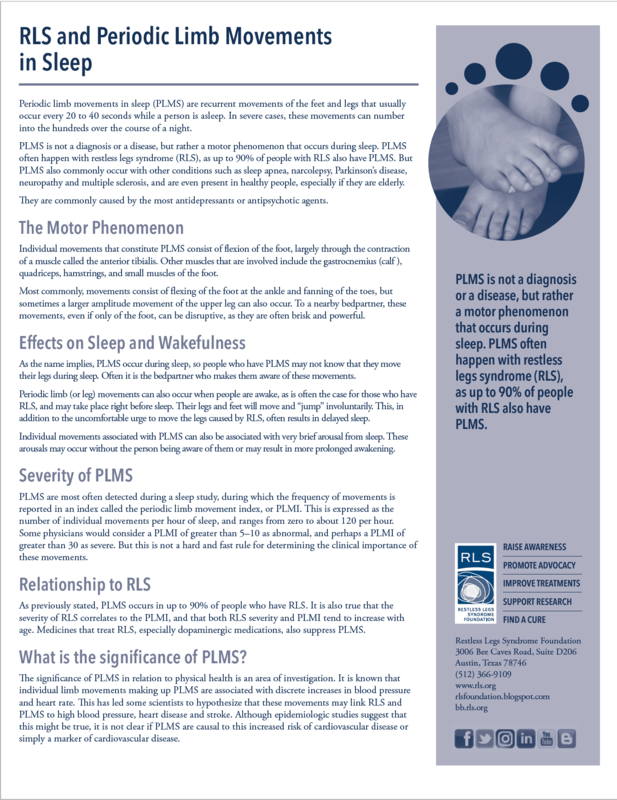 Inside: PLMS occurs in up to 90 percent of people who have RLS. Find out what it is and understand the significance. 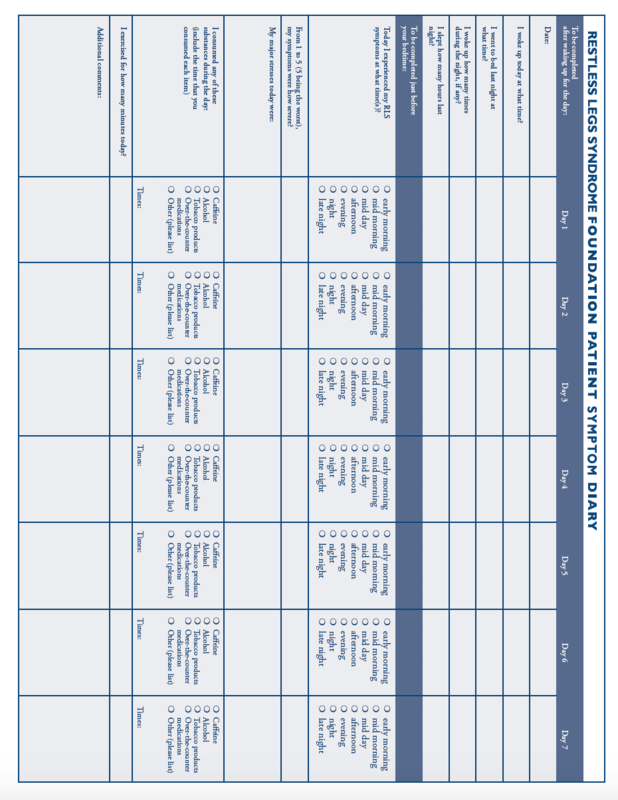 Inside: Learn more about the program and priority research areas for RLS. 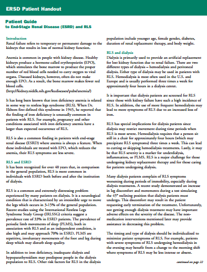 Inside: This handout will help you understand what End-Stage Renal Disease (ESRD) is and the connection with RLS. 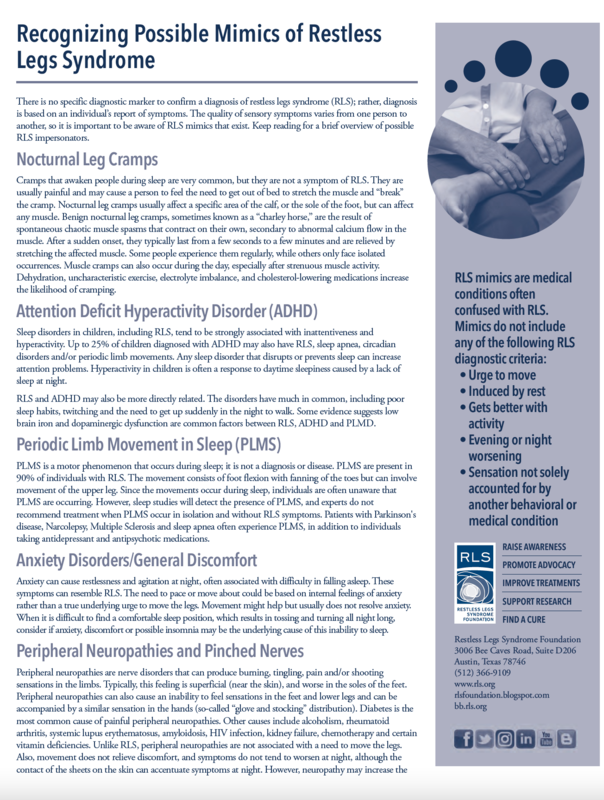 Inside: Our current comprehensive bulletin providing the latest information for the care and management of RLS patients. Inside: Vital considerations in the care and treatment of the pregnant woman with RLS. 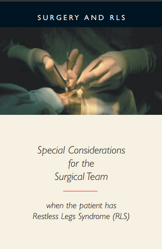 Inside: Special considerations for the surgical team in the care and treatment of the patient with RLS.